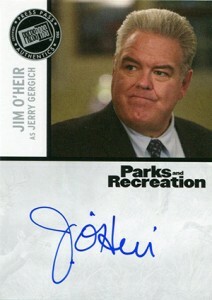 The 2013 Press Pass Parks and Recreation Autographs checklist delivers an impressive number of not only the show's main cast, but some of the top names in comedy today. 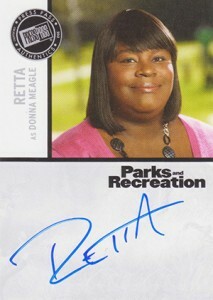 The set's 13 signers include nearly all of Parks and Rec's lead stars, but several notable guests as well. 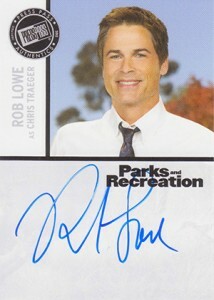 Leading the way for Parks and Recreation fans are Amy Poehler and Rob Lowe, both of whom have had notable careers outside of the show as well. 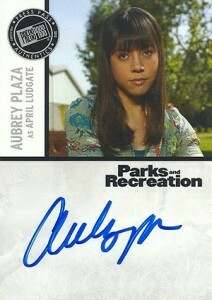 Aubrey Plaza, Nick Offerman and Aziz Ansari also have autographs in the set, all of whom appear poised to have their place in the spotlight grow once the NBC sitcom finishes its run. 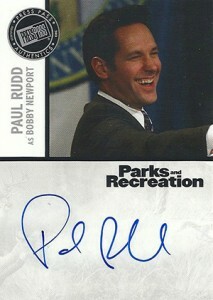 Of the guest stars, the most recognizable name is Paul Rudd, a name this close to being a Hollywood A-lister. 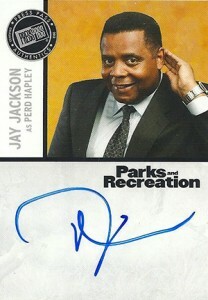 2013 Press Pass Parks and Recreation Autographs are inserted two per box. All are signed on-card. And while the 13-card checklist isn't very big, particularly with multiple autographs in a box, Press Pass has added a handful of parallels and variations to the mix to make things a little more challenging. Gold Metallic parallels are numbered to 99 or less. Red Metallic versions have just 25 copies. 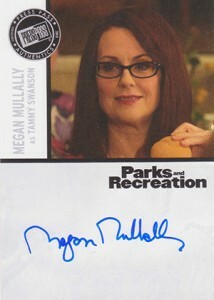 Both of these can be identified by the Press Pass logo on the front of the card. 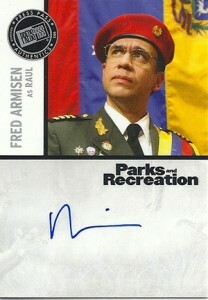 There are also red ink signatures and a limited number of inscriptions. 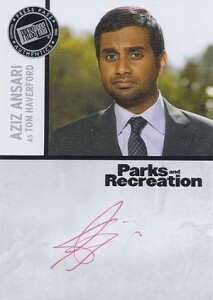 It is worth noting that it appears as though Aziz Ansari signed all of his cards with a red pen. 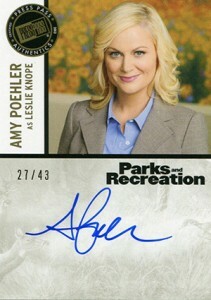 Press Pass also announced that Amy Poehler and Rob Lowe have rare versions that come with a different photo. 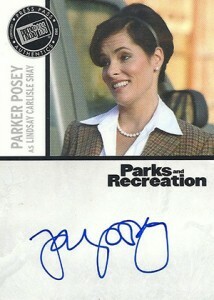 Other than Parker Posey, these are the first certified autograph cards for the rest of the signers (excluding cut signature cards). 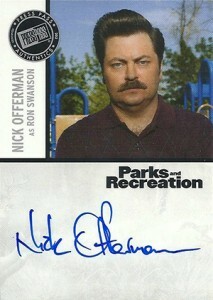 You can check out a full set of 2013 Press Pass Parks and Recreation autographs below. We've also highlighted some of the other films, TV shows and projects the signers have done. Got a favorite actor or character? Click on the card name or image to shop for singles on eBay.